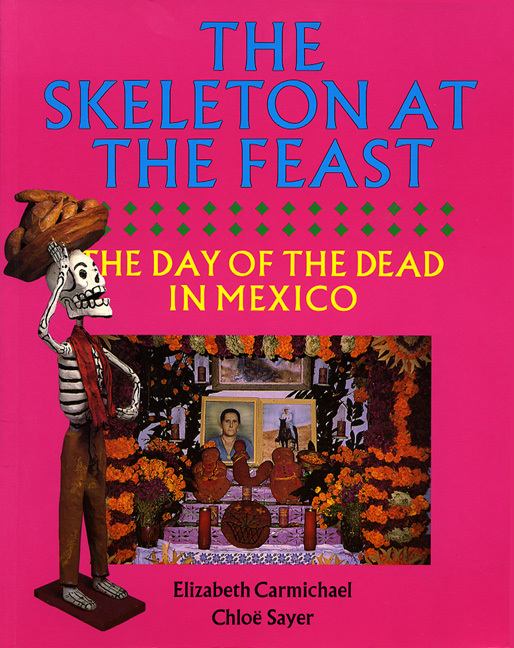 In this unique work, the authors explore both the historic origins of the Day of the Dead and its colorful present-day celebrations in Mexico and the United States. All over Mexico, early in November, families gather to welcome the souls of the dead on their annual visit home. The smells of burning copal incense and pungent cempasúchil (marigolds) mingle with the aromas of fresh bread, new clothing, sweets, and candles. One of Mexico's most important festivals since prehispanic times, the Day of the Dead is an occasion for celebrating and feasting, cleaning and decorating graves, dancing and making music. In this unique work, the authors explore both the historic origins of this holiday and its colorful present-day celebrations in Mexico and the United States. Interviews with Mexican artists and crafters who provide goods for the festival—from personalized sugar skulls to gigantic papier-mâché skeletons—offer a fascinating glimpse into traditional and contemporary attitudes toward death and the dead. Elizabeth Carmichael is curator of the Latin American collections of the British Museum. Chloë Sayer is author of several books on Mexico. Mexicans often say: somos muy fiesteros, 'we enjoy a good celebration', an opinion that is abundantly evident in the large number of festivals and ceremonies that crowd their calendar. To these public events must be added the private family celebrations in which the same zestful relish for life finds further expression. That a festival to do with the dead should be a joyous occasion perhaps strikes those of us from other cultures with our different perceptions as something hard to come to terms with. The Day of the Dead is just that: a festival of welcome for the souls of the dead which the living prepare and delight in. The souls return each year to enjoy for a few brief hours the pleasures they once knew in life. In the urban setting of Mexico City and other large towns the celebration is seen at its most exuberant, with figures of skulls and skeletons everywhere. These mimic the living and disport themselves in a mocking modern dance of death. It is not surprising that so colourful an occasion should have become a tourist event. Another celebrated Mexican author, Carlos Monsiváis tells us that in Mixquic, a town close to Mexico City, and at Pátzcuaro in the State of Michoacán, both famous for their celebrations of the Day of the Dead, the cameras have come to outnumber the candles in the cemeteries: 'Kodak takes possession', and 'Mexico has sold its cult of death and the tourists smile anthropologically satiated' (Monsiváis: 1970). The dead move with the times in Mexico. Not far away from the tourist routes there is, however, another Mexico. In the rural areas, in every village or small town, the Day of the Dead is celebrated beyond the glare of flash-bulbs and noise of whirring video cameras. Each household prepares its offering of food and drink for the dead to be set out on a table among flowers and candles. The blue smoke of burning copal incense sanctifies the ceremony, just as it has done for centuries. Outside, the peace is shattered by the explosions of the rockets set off to mark the fulfilment of an obligation deeply felt. The whole company of the living and the dead share in the flowering and fruiting of the land which both have cultivated. Whatever distractions tourism brings—the competitions for the best offering, the 'discos' for the dead with all their sequins and grotesqueries—there is at the core of it all an old tradition which informs and invigorates every kind of manifestation of the event and which has so far defied debasement. What is astonishing to the visitor is that so many different styles of celebration can co-exist under one sky. Today draculas, demons and Batman mingle with the skeletons and sugar skulls; the cardboard witches and plastic pumpkins of Halloween are making their appearance alongside the traditional puppets and toy coffins; the great museums and galleries mount set-piece ofrendas (offerings) for the Day of the Dead, designed by artists and curators. A short step away, one seems to be in the midst of something that has endured through centuries, some parts of it perhaps from pre-Hispanic times. In the countryside there are few if any skulls or skeletons; the images of the Christian saints who replaced the old gods stand on the household altars surrounded by the same offerings of food and flowers as were prepared for ancient feasts. The yellow marigolds—the cempasúchil or 'flower of the dead'—give off their aromatic scent to attract the souls and draw them to the offering prepared in their honour. He makes an important distinction between death cults and cults of the dead. The death cults, of which Mexico has its share, centre upon the image of Death as the 'Grim-Reaper', the Santísima Muerte (Most Holy Death) associated with the practice of witchcraft. From at least the eighteenth century, and perhaps before then, wooden images of Death personified as a skeleton were carried in procession through the streets, riding triumphant in carts and carriages. These took their descent from the images of Death of medieval Europe, brought to the New World from Spain in the early sixteenth century. Painted on the tiered catafalques associated with funerary rites in Colonial Mexico, the same skeletons ride and prance. They appeared on playing cards, in books and tracts and in the nineteenth century were triumphantly transmuted by the hand of the famous engraver of popular prints, José Guadalupe Posada. By this time, they were less the mocking harbingers of death, but rather wry commentators upon the vanities of life. As toys, with nodding heads and dangling limbs, they have danced their way into the modern world, where they have not entirely lost their function as vehicles for satire. More often, they are simply amusing playthings which may sometimes produce a slight frisson, as felt for a Halloween witch, but never a grim and ghoulish shudder. In the modern world, Carlos Monsiváis suggests, 'death is still the terrible yet amusing entity that establishes a compromise between memory and the sense of humour, and between the sense of humour and the irremediable' (Monsiváis: 1987).